At the end of last 2010 we capped off an incredible year with SenchaCon – by far the biggest gathering of Sencha developers ever assembled. We descended on San Francisco, 500 strong, and spent an amazing few days sharing the awesome new stuff we’re working on, learning from each other, and addressing the web’s most pressing problems. Now, we’re proud to release all of the videos from the conference completely free for everyone. You can see a full list on our conference site, where you’ll find days worth of material all about Ext JS 4, Sencha Touch and all of the other treats we’re working on at the moment. Some of the videos in particular stand out for me – Jamie’s Charting and Layouts talks were spectacular, as was Rob’s Theming Ext JS 4 talk. On the Touch side, Tommy’s talks on Performance and Debugging are required viewing, as is Dave Kaneda’s characteristically off the cuff Theming talk. If you’re so inclined, you can find the slides for this talk on slideshare, and if you can still stand the sound of my voice check out my other presentation on Ext JS 4 Architecture, focusing chiefly on the new data package (slides). Last time, we looked at some of the features of the new class system in Ext JS 4, and explored some of the code that makes it work. Today we’re going to dig a little deeper and look at the class definition pipeline – the framework responsible for creating every class in Ext JS 4. As I mentioned last time, every class in Ext JS 4 is an instance of Ext.Class. When an Ext.Class is constructed, it hands itself off to a pipeline populated by small, focused processors, each of which handles one part of the class definition process. We ship a number of these processors out of the box – there are processors for handling mixins, setting up configuration functions and handling class extension. The distinction between preprocessors and postprocessors is that a class is considered ‘ready’ (e.g. can be instantiated) after the preprocessors have all been executed. 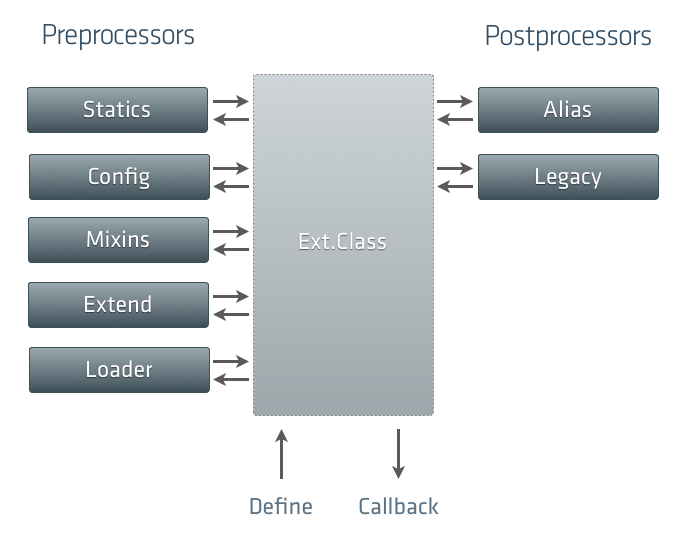 Postprocessors typically perform functions like aliasing the class name to an xtype or back to a legacy class name – things that don’t affect the class’ behavior. Each processor runs asynchronously, calling back to the Ext.Class constructor when it is ready – this is what enables us to extend classes that don’t exist on the page yet. The first preprocessor is the Loader, which checks to see if all of the new Class’ dependencies are available. If they are not, the Loader can dynamically load those dependencies before calling back to Ext.Class and allowing the next preprocessor to run. We’ll take another look at the Loader in another post. After running the Loader, the new Class is set up to inherit from the declared superclass by the Extend preprocessor. The Mixins preprocessor takes care of copying all of the functions from each of our mixins, and the Config preprocessor handles the creation of the 4 config functions we saw last time (e.g. getTitle, setTitle, resetTitle, applyTitle – check out yesterday’s post to see how the Configs processor helps out). What happens above is pretty straightforward. We’re registering a preprocessor called ‘statics’ with Ext.Class. The function we provide is called whenever the ‘statics’ preprocessor is invoked, and is passed the new Ext.Class instance, the configuration for that class, and a callback to call when the preprocessor has finished its work. That’s it for today. Next time we’ll look at some of the new features in the part of Ext JS 4 that is closest to my heart – the data package. 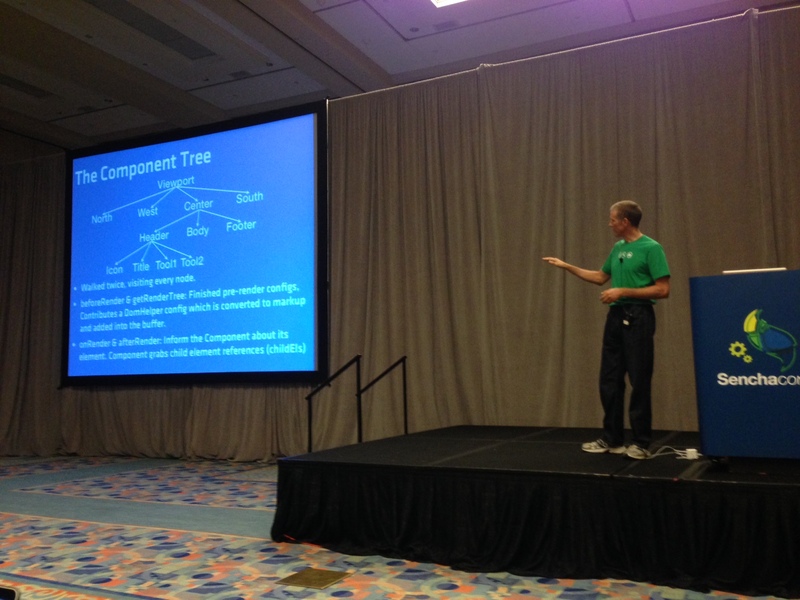 The slides are available on slideshare and include the code snippets I presented. The Dribbble example used in the talk is very similar to the Kiva example that ships with the Sencha Touch SDK, so I recommend checking that out if you want to dive in further. View more presentations from Ed Spencer. One of the new components we just unveiled for the Ext JS 3.3 beta is PivotGrid. PivotGrid is a powerful new component that reduces and aggregates large datasets into a more understandable form. A classic example of PivotGrid’s usefulness is in analyzing sales data. Companies often keep a database containing all the sales they have made and want to glean some insight into how well they are performing. PivotGrid gives the ability to rapidly summarize this large and unwieldy dataset – for example showing sales count broken down by city and salesperson. We created an example of this scenario in the 3.3 beta release. Here we have a fictional dataset containing 300 rows of sales data (see the raw data). We asked PivotGrid to break the data down by Salesperson and Product, showing us how they performed over time. Each cell contains the sum of sales made by the given salesperson/product combination in the given city and year. The first half of this ought to be very familiar – we just set up a normal Record and Store. This is all we need to load our sample data so that it’s ready for pivoting. This is all exactly the same code as for our other Store-bound components like Grid and DataView so it’s easy to take an existing Grid and turn it into a PivotGrid. The measure and the items in the axes must all be fields from the Store. The aggregator function can usually be passed in as a string – there are 5 aggregator functions built in: sum, count, min, max and avg. It’s easy to change the axes, dimension, aggregator and measure at any time and then refresh the data. The calculations are all performed client side so there is no need for another round-trip to the server when reconfiguring. 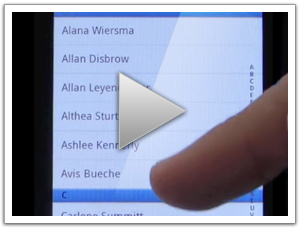 The example linked above gives an example interface for updating a PivotGrid, though anything that can make the API calls above could be used. I hope you enjoy the new components in this Ext JS 3.3 beta and look forward to comments and suggestions. Although we’re only at beta stage I think the additions are already quite robust so feel free to stress-test them.